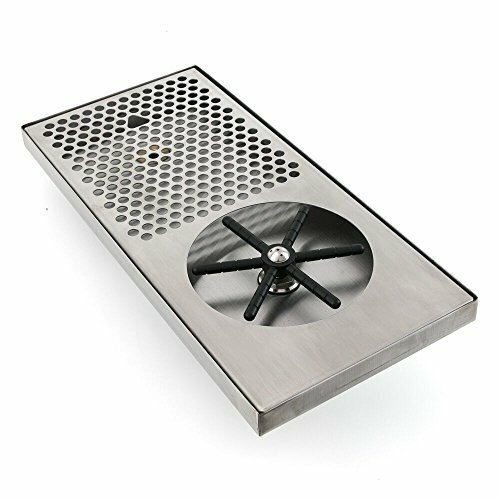 7'' x 15'' x 7/8'' Rinser with Side Spray, NSF Approved. 7" by 24" by ⅞" Rinser with Side Spray In most restaurants, coffee shops and cafes, the rinsing of glasses, shot glasses, pitchers and cups is a task that is repeated many times a day. But ever since we developed the pitcher rinser (as we called it back then), we've had a much easier and faster way to rinse these vessels. With our rinser, any vessel with a diameter from 1 to 4½ inches can now be rinsed in seconds. Imagine the usual steps needed to rinse a pitcher: take the pitcher walk to the sink turn on the faucet rinse the pitcher turn off the faucet put the pitcher in the drainer dry your hands walk back. It takes 8 individual steps to perform this simple task and it's done over and over again without even thinking about it. But imagine that you can save time and energy by doing this instead: take the pitcher push it down on the rinser sprayer let it rinse for a few seconds take the pitcher off the rinser and put it on the drainer. Done. That's all there is to it. If you have any questions about this product by Espresso Parts, contact us by completing and submitting the form below. If you are looking for a specif part number, please include it with your message.